Crossing the finish line of my first full marathon. Pretty much the proudest moment of my life. Relief. Relief and a tremendous sense of accomplishment. That’s how I feel after my first full marathon. After a pretty rough taper week, I was nervous for race day. I think I cried more in the week leading up to the marathon than any other time in my life. I felt like I aged 10 years from worry and dread. But, I did it! I crossed that finish line triumphantly with a final time of 4:33:42 and it was one of the greatest accomplishments of my life. I was a bit behind my goal time of 4:15, but I blame that on a crowded porta-potty at 8.5K. I have got to find a way to get my nervous bladder under control. I spent the first 8K of that race worried about peeing my pants. I’m not going to lie. I did think about peeing my pants in an effort to save time. All runners have heard these stories. But then I had a reality check and realized I’m not an elite runner, and this would just be sad, rather than an amazing way to set a PB. 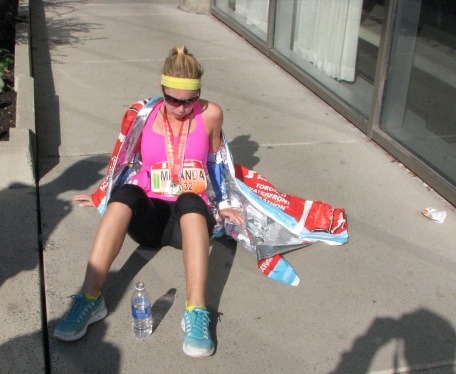 The race had a few defining moments for me. The first was where the marathoners split from the half marathoners. That was big. Up to that point, it felt like any other race. That made it real. The run out to the east end was a bit desolate and sad. Spectators were sparse and with far less runners it felt quiet. Thankfully, I had a brand new playlist full of motivational, running inspired songs so I was bopping along at a decent pace. Break My Stride, Walk of Life… how can you not hold your head a little higher with these tunes?! As expected, my knee started to act up around the halfway mark. I tried to block it out. There was no turning back, so sore knee be damned. This was happening. My knee was in a bad state by this point, but I think some banana saved my life. Some wonderful spectators were handing out small chunks of banana in the beaches and I was basically taking anything people handed me. Race day, by the way, is the only day aside from Halloween where it is totally acceptable to take food from strangers. After I ate the banana, my knee felt better. In fact, I barely noticed it. I got a huge burst of energy when I saw Graham, and as requested, he brought me cookies which I nibbled on as we ran. While many runners around us were fading, I felt a renewed sense of energy and the next couple of kilometres flew by as we chatted about the race and his morning so far. By kilometre 35, I suddenly realized I was on my longest run of my whole life and I started to fade a bit. Graham kept commenting, “Wow, this race is just flying by.” I would reply, “I’m glad you think so!” By this point, every kilometre felt like it took 2 hours. I hit the wall at 38K. I was tired and this part of the route was horrible and convoluted. With every twist of the course, I expected to see familiar territory and to feel a sense of relief knowing we were almost there, but every turn just brought more open road. And my knee was killing me. I had about a 15 second meltdown. But I gave myself a pep talk, ate some Sport Beans, and got it together. I got emotional at the 40K marker. It was the first time I had ever seen a number over 30 on a run, and it was the first moment where I really realized I was going to do it. I was going to finish my first marathon. Graham reminded me we still had 2K left so I wasn’t allowed to cry yet. Save the tears for the end. There were more spectators by this point and I could literally feel the energy of the finish line. I ran the next 2 kilometres with a smile on my face. When we finally got to the finishers chute, I picked up speed. I saw my parents cheering and taking pictures and I wanted to finish strong and triumphantly. I wanted those finish line photos to be epic. Crossing the finish line was indescribable. It was truly one of the best moments of my life. So proud and happy. And so very tired and sore. We started our walk to the meet up area. I was slow. I moved like Frankenstein. I was half laughing, half crying. I probably looked insane. But I did it! I ran a marathon! This might read a bit like an Academy Award acceptance speech, but honestly, I feel like I owe my success to a lot of people. First, thank you to my husband Graham. You put up with my craziness the last couple of months and supported me the entire way – even when I spontaneously burst into tears over breakfast. If you didn’t run that last 10K with me, I’m not sure I would have made it. Thank you for bringing me cookies as requested. I was so glad to have you there at the finish line to be a part of one of my great life accomplishments. I promise I’ll be more normal now. To my parents, who despite being fresh off a plane from Scotland and very jetlagged, still came to support me at the marathon, and filled my fridge with yummy post-race recovery food. Thank you for encouraging me and supporting me even though I know you think I’m nuts… especially that day I ran 32K on your treadmill. I tried to walk to pick up my bag, but needed a little rest first. Thanks also to my in-laws – Janet and Ian – for being super supportive and encouraging the whole way, and to my mother-in-law who, with her impeccable timing, called us at 39K mark in the race all the way from her vacation in Turks and Caicos. I was fading at this point, and your encouraging words via speaker phone helped me push me through a tough spot. I also want to thank The Running Room for their amazing marathon training clinic. There were times that I didn’t trust you (Our longest run is only 32K? Are you SURE that is enough? ), but you challenged me to push my limits and prepared me for the biggest athletic accomplishment of my life. Even though I hated that hill training, I was thankful we did it on race day. A special thank you to Robyn, our clinic leader, who always answered my stupid emails and ran with me numerous times, even though I was always last. Thanks to Ed, a new running friend I met through the Running Room training clinic who let me hang out in City Hall to warm up and use the washroom before the race. That was much appreciated because it was effing cold outside. To my awesome friends Luca and Mary. As a result of their absolutely perfect timing, they were watching for me right where I got stuck in the porta-potty lineup. It was great to chat with friendly faces for my wait, rather than stand there anxiously worrying about the time I was wasting. To Lululemon for making a running top that doesn’t chafe…even after 4+ hours of running. Thank you! 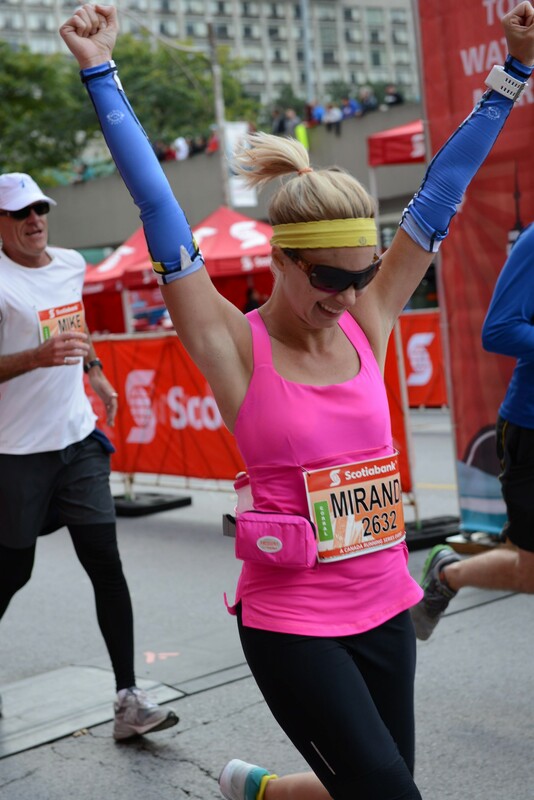 A huge shout-out to Canada Running Series and Jenna Pettinato (@JennaPettinato) for asking me to be a STWM Digital Champion. I was, and have always been honoured to hold the title, and if it wasn’t for her reaching out to me on Twitter that day back in the Spring, I would never have signed up for the marathon. You pushed me commit and for that, I’m super thankful. And of course, a massive thank you to all the other Digital Champions. What an amazing support group. Every time I had a question, all I had to do was post to Facebook and Twitter and I was immediately met with instant encouragement and advice. You guys are the best. Thank you to Nike Running Canada, Andrew Thuss (@thussrunlife) and former Nike Run Lounge leader Jennifer Dawson (@BigDealDawson). If it wasn’t for you encouraging me to come out to the Nike Runner’s Lounge 2.5 years ago, I would never have started running regularly. You challenged me to first half marathon and got me hooked on something that quickly became a passion. Thank you for inspiring me. A big thank you to the weather for not sucking. Even when my knee was aching and my body hurt, I just kept thinking, “at least it’s sunny.” Thank you also to Clarins for making an awesome SPF40 sunscreen that stays put despite sweating for hours. And finally, to all my friends and coworkers who sent me encouraging emails, texts and Facebook messages over the last several weeks and months. Knowing that you were all thinking of me while I was running made me happy and motivated me to continue, even when it sucked. Now, time to update my bio and call myself a marathon runner. Aww thank you so much Rod. It was definitely one of my biggest and most proud accomplishments. But I don’t think I’ll be signing up for another one anytime soon! This is one of the best things you have ever written. I’ve been giggling one moment and sobbing the next. Know we are all so proud of you. I don’t know how you do all you’ve accomplished in your running pursuits. I could never do the same. You are such an inspiration. Aww… thanks so much Sarah. I’m so glad I was able to convey the emotion of the whole experience. You’ve done a 10K now… maybe time for a half? That’s how it all starts! I got chills reading this! Congrats lady — what an accomplishment! Great re-cap! Way to finish strong. So inspiring. CONGRATS! Such an amazing accomplishment. I actually got a little misty eyed as I read this, and I don’t even know you haha. Great recap and congrats. Very inspiring ! Good job, running a marathon is a mental and physical accomplishment and you should be proud of you ! I hope you will keep writing (and running) for the blog 🙂 What are your next goals for 2014 ? 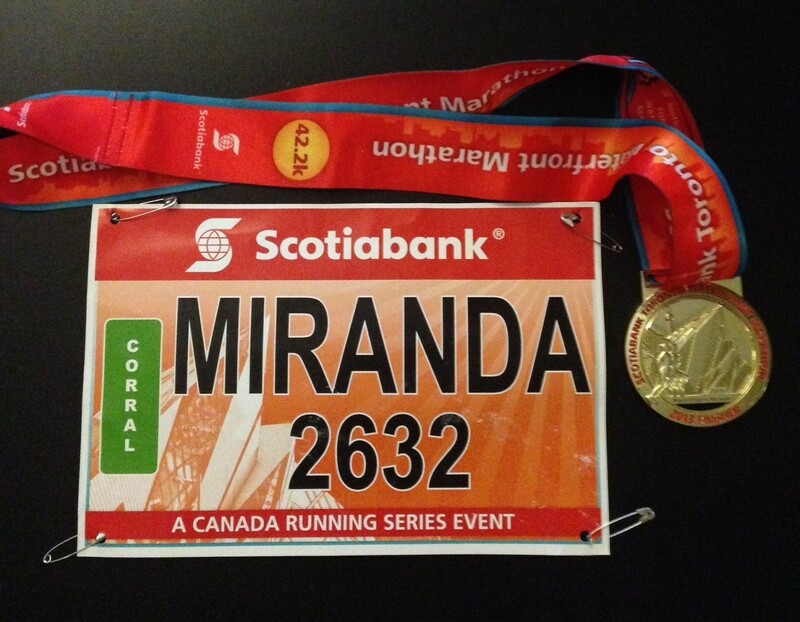 Congrats Miranda!! Amazing accomplishment. I did the half last weekend and heard you speak at the race expo – well done! Really? I said that? Haha. I am now saying I will never run another full marathon so maybe I’ll change my tune in a few months 🙂 we’ll see. Marathon running is for crazy people.